Your success as a professional services company depends on satisfied clients for repeat business and referrals. Automating sales, marketing, and service processes and integrating them with your financials helps you maintain customer satisfaction and employee productivity. 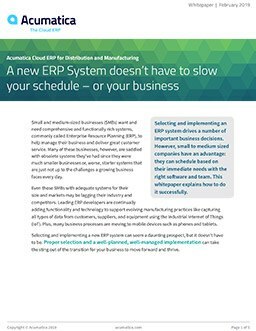 Acumatica’s full-function ERP for customer satisfaction helps you manage leads, contacts, opportunities, cases, and business accounts. Integrated CRM and ERP accounting provide a consolidated view of all prospect and customer activities along with their financial implications in real-time and accessible to all authorized team members. Improve communications and engagement with customers and partners through the Acumatica Customer Portal. Customers enjoy 24/7 access to check job or project progress, see delivery schedules, create new support cases, update information, and even place orders for additional services. Integrated marketing and sales automation tools track, manage, and assign leads to sales teams with a complete view of opportunities, enabling sales team to respond faster, reduce sales cycles, and increase close rates. Define your unique company sales workflows in Acumatica for services and items using pre-packaged examples. Add additional order types with specific processing. The module supports flexible pricing and discounting policies. Use Acumatica contracts to configure various combinations of terms and services and specify recurrent billing. Contracts can be defined for services delivered over a period of time and/or for service agreements for maintenance during a product’s warranty period. Service rates can be configured per incident, per hour, per specific service or prepaid. Acumatica service management provides tools to improve response times, increase customer satisfaction, reduce support costs, and accurately bill services. With the content management solution, service and support teams can access all the documents and activities sent to customers including sales contracts, marketing offers, notes, emails, and other communications. Support teams can quickly trace the full history of customer interactions, promises, and feedback. Service management is organized by “case”, the vehicle for tracking requirements, activities, time and materials, and related phone calls and emails. A case can be created from completed web forms or entered directly. Cases are assigned and escalated according to local policies. Integration with financial modules ensures that cases are billed according to client support contracts. The Acumatica Financial Suite facilitates incident (case) billing and recurring billing for improved cash flow, billing accuracy, and customer service. You can set up subscriptions, metered usage, on-demand, tiered services, one-time transactions, payments, and invoices across customers, accounts, districts, organization, channels and product lines. The Deferred Revenue Management (DR) module automates and accurately accounts for revenue scheduled for future collection, as when a service is delivered over a period of time. Revenue is recognized for the service as rendered. Integration with other financial modules provides accurate accounting of both deferred revenues and deferred expenses. "Conservatively, we’re looking at an increase of $600,000 in EBITDA profitability, once all of the suites are implemented. That’s massive."